The thing about Flunk is quite simple. It is all about the love of music - and the lack of words. Or being tired of words. Organised by Ulph, Flunk are the collective enterprise of the former, guitarist Jo Bakke (he used to be in Norwegian pop act Happy Campers, who moved on to electronic music and even had a 12" on Ninja Tunes, and now also is one half of house-combo Antenna (Guidance)), and Anja Øyen Vister (a medical student who has been singing for years, but only occasinally in a band setting). There are also others adding layers during the process of making Flunk music, including Ivar Winther and his flute, and Ulphs girlfriend, Tine Skarland singing. 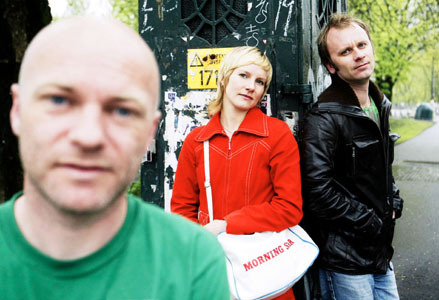 Ulph has made four albums with Norwegian pop act Folk & Røvere since 1996, receiving both critical acclaim and some brief moments of chart success for the slightly odd mix of Norwegian lyrics and downbeat music. The first two albums were made with Beate Lech, now enjoying success on her own with Beady Belle. Flunk, then, is basically about letting the music speak louder than the ever flowing words. The soundscapes are mid-tempo, and with the sound of guitars almost always present, it puts a kind of rock touch to the chill-out feel and pop tunes. Well, that is the general idea, anyway.